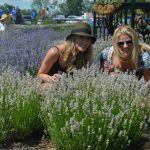 Come for this fun and interactive workshop and learn how to prune, plant, harvest and care for your lavender plant. We’ll give you a hands on demonstration of how to prune, give you companion planting ideas and discuss the culinary uses for lavender too! Workshop fee includes a workbook and a lavender plant to give you joy for years to come! This time of year brings me back to my grandmother’s orchard with its wonderful fruit selection – plums, pears, peaches, and apples. 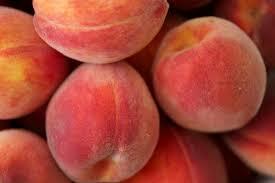 My all time favourite were the wonderfully ripe peaches. They were so fragrant and succulent that the juices ran all over with just one bite. I can still smell the aromas just thinking about my childhood. In days gone by we had many peach orchards in beautiful Essex County. We even celebrated peaches in our little town of Harrow with a festival and the crowning of the Peach Queen. The Harrow Research Station developed a number of peach varieties such as the Harrow Beauty and Harrow Diamond Peach. Today, you can still find fresh peaches at our neighbour’s Leslie and Doug of the Fruit Wagon and Maria’s on Ridge Road. 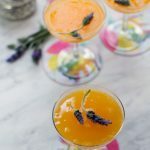 So today in celebration of the long weekend and fresh Essex County peaches I thought I’d share a lovely adult beverage recipe that incorporates my favourite herb- lavender and of course those luscious peaches. Add water into a small pot. Bring to a boil add sugar stir until completely dissolved. Take off the heat and add 1 teaspoon of Serenity Lavender’s culinary lavender. Put the lid on the pot and steep for about 20 minutes. Strain the lavender and put the lavender simple syrup mixture into the fridge until cooled completely. 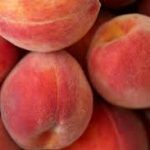 Blend the peaches in a blender until smooth. 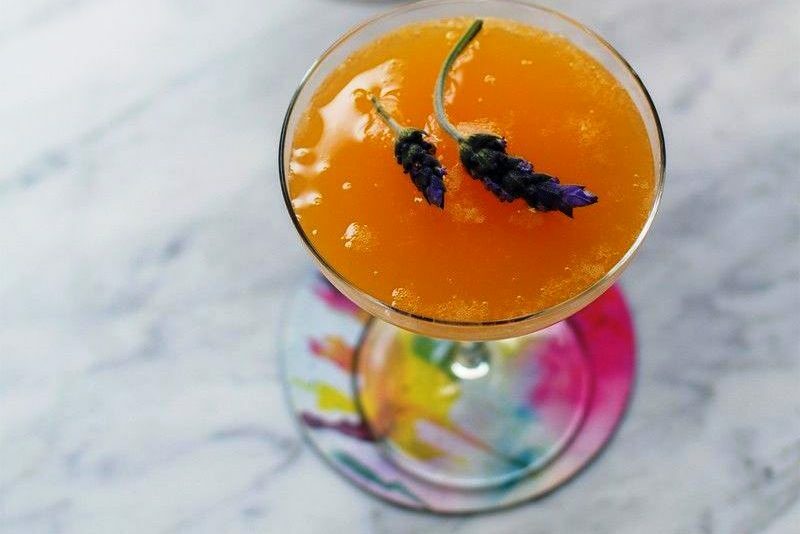 Place 1 tablespoon of peach puree into a glass add 1 tablespoon of lavender simple syrup and top with chilled sparkling wine. 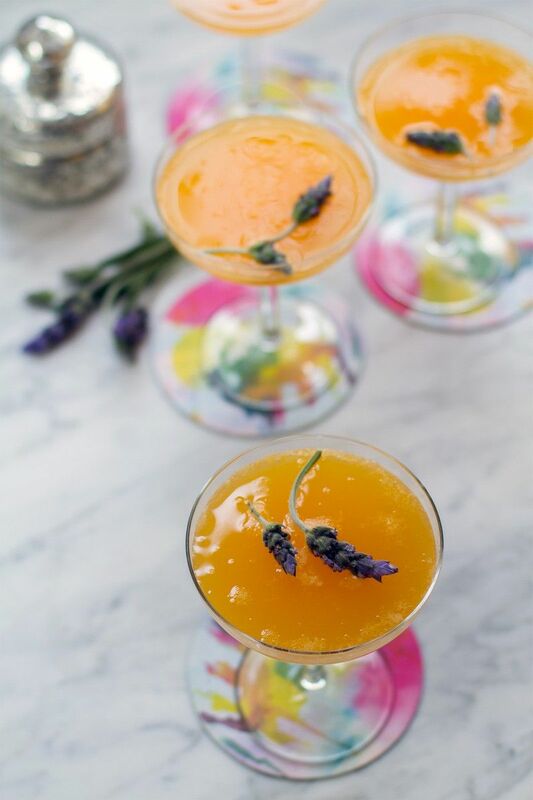 Decorate each glass with a lavender sprig and serve straight away! Use 1 parts puree to 4 parts sparkling wine. Good quality peach juice can be used as a substitute. 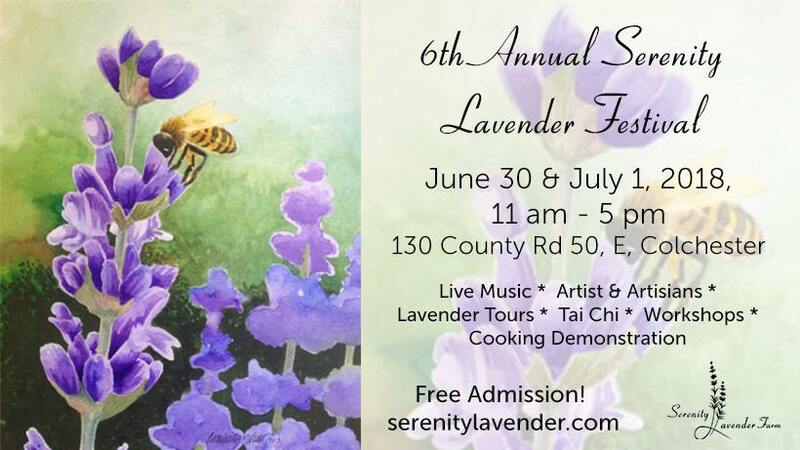 Serenity Lavender is proud to host our 6th Annual Lavender Festival! 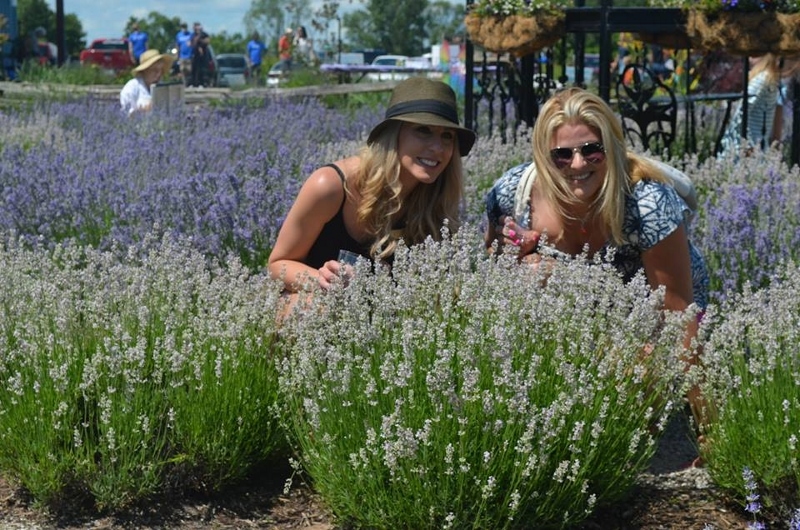 This event was inspired by the beautiful aromas flavours and colours of lavender. Mother Nature was not kind to our beautiful lavender plants this winter, with the freeze thaw cycles we suffered significant crop loss and plant damage, but with every hardship comes opportunity. 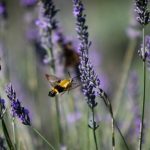 We took this opportunity to redesign our lavender gardens and to teach our customers how to assess plants for cold damage and how to prune plants. This year the festival incorporates our recently opened hospitality facility and Bistro 42. We’re offering activities for adults and children alike. 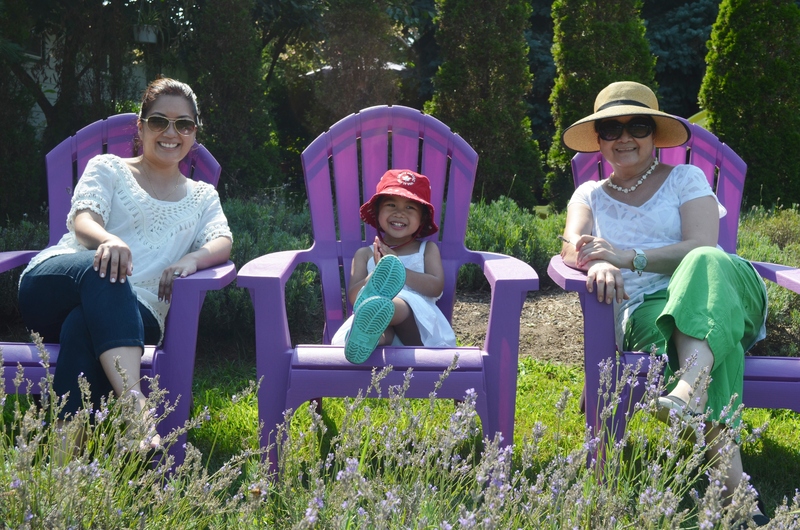 We’re ready to entertain your children with whimsical storytelling and readings from local children’s authors, musical interludes, exploration of the lavender labyrinth, chalk art area, the magical wishing tree and if they’re lucky they may even witness the dance of the butterflies. Food and beverages available for purchase throughout the day. Reservations required for Bistro 42. Treat yourself and your friends or loved ones to the pleasure of a Victorian Afternoon Tea. 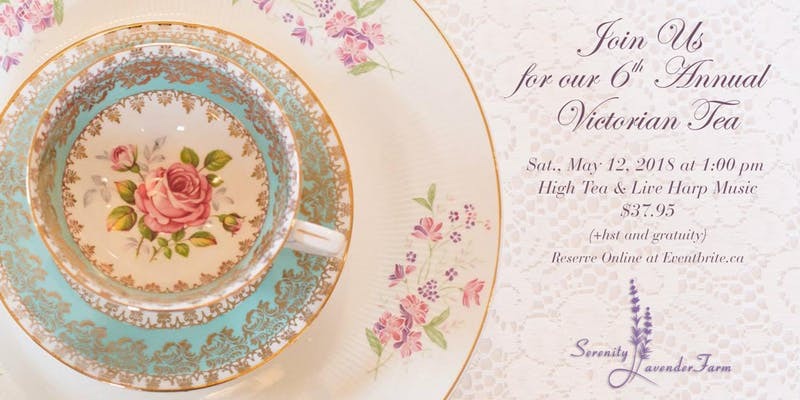 Serving hand made signature scones, delectable finger sandwiches and desserts on our finest antique china and linens. The beautiful harp music and surroundings will surely transport you to another place and time. Advance tickets only. Come for authentically memorable experience. 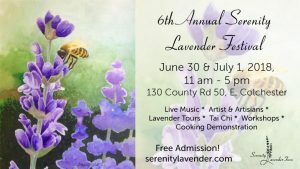 Tickets $37.95 per person (gratuity extra, click here to purchase), includes made-from-scratch scones, sandwiches, and desserts served with Serenity Lavender Farm’s specially blended teas. Wine by the glass available for purchase. Spring has sprung as we look forward to the burst of wildflowers in our secret oasis. 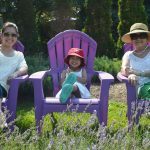 Come discover our 40 acre Carolinian forest with its beautiful display of wildflowers for you, our customers, to enjoy! You’ll be lead on a guided hike, treated to wine tasting, an outdoor camp style gourmet lunch, prepared by our Executive Chef, Steve Meehan while you learn about the beautiful wildflower species that inhabit our natural wonderland. We will hike rain or shine, please wear boots. 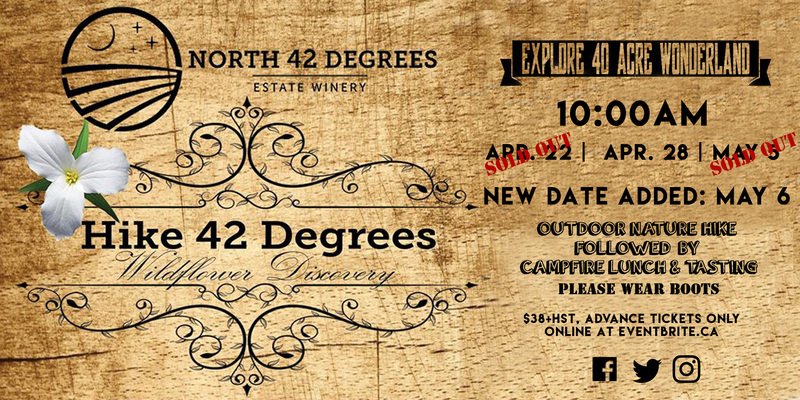 April 22 and May 5 sold out. Tickets $38+HST available through Eventbrite. Click here to purchase. 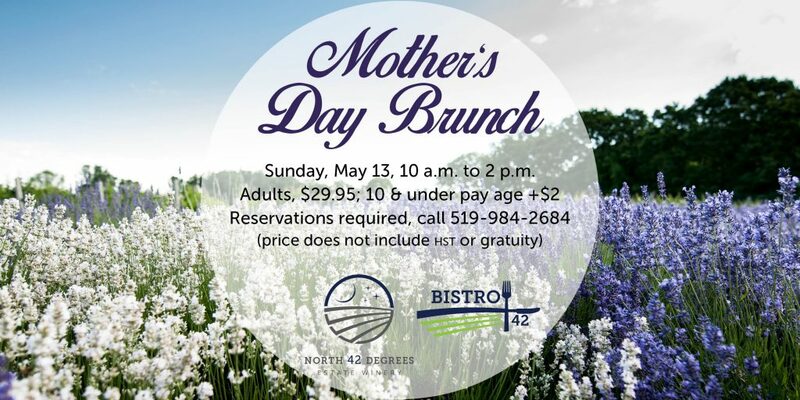 Spoil Mom with a delicious brunch at Bistro 42! Brunch will be served from 10 a.m. to 2 p.m. in our beautiful dining room overlooking the North 42 Degrees Estate Winery vineyards and the Serenity Lavender Farm gardens. Reservations are required. Adults $29.95, children 10 and under pay age +$2. Price does not include HST or gratuity. Call to book, 519-984-2684 or 519-738-6111. THIS EVENT IS SOLD OUT – thank you to everyone for your enthusiastic interest! Why have a beautiful hand made wreath just for Christmas, when we can welcome in Spring with an Easter Wreath too. 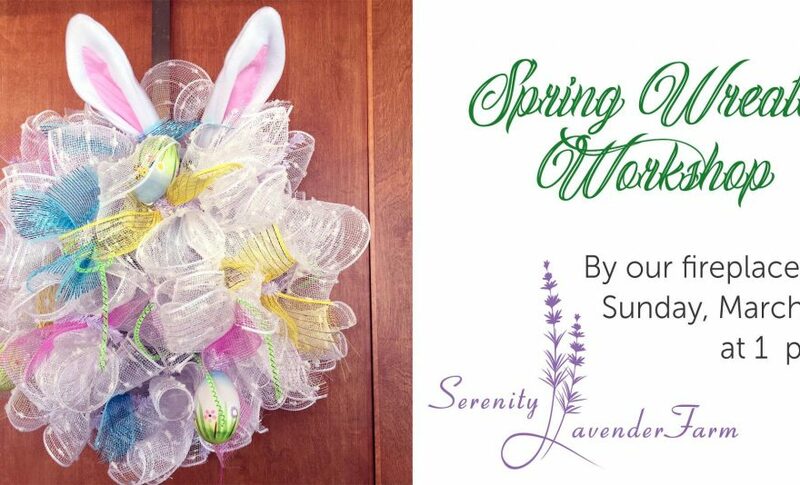 Come learn how to make an adorable wreath for your door to celebrate spring! We’ll use decorative mesh and ribbon, and lots of Easter extras. All materials provided. The class is $45.00 plus hst for a couple of fun, relaxing and creative hours… just… for… YOU!! Sunday, March 25 at 2:00 p.m. The pisanki derive from an ancient tradition when eggs, the symbol of life, were endowed with magical properties and were thought to ensure both a plentiful harvest and good health. 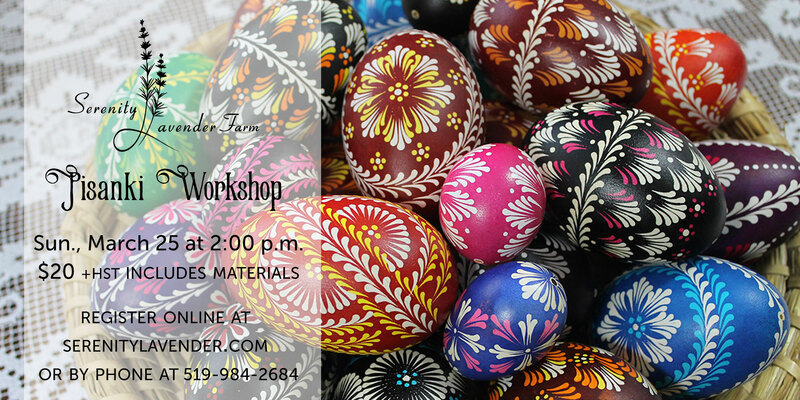 Spend an afternoon by our firepalce learning this Eastern European tradition while creating beautiful pisanki for your Easter celebration. $20 +hst includes all materials. Click here to register. Winter is here! And alongside winter fun come the challenges of the season, including dry skin, chapped lips, and keeping your house feeling spring fresh. Here are a few tips and tricks for meeting winter’s challenges head on so you can enjoy beauty of the season. Linen Spray – lightly mist sheets and pillows with Serenity Lavender Farm Linen Spray. You can spray your sheets when you turn the bed down at night, or in the morning while making the bed. Sachet – Tuck a sachet under the pillow when you make your bed. Flip your pillow over as you go to bed for a gentle scent of lavender. 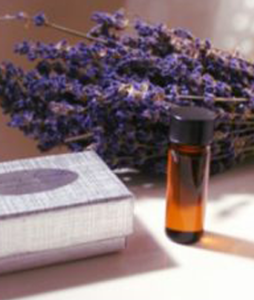 Essential Oil – lightly dab Serenity Lavender Farm Essential Oil behind your ears or on the bottoms of your feet. Treat your Feet: Feet can take a beating in the winter and should receive some extra TLC. Foot Bath – add a few drops of Serenity Lavender Farm Essential Oil to a warm foot bath to relax and relieve stress. Foot Cream – mix a several drops of Serenity Lavender Farm Essential Oil to Coconut Oil. Spread on dry, cracked feet then put on a pair of socks before going to bed. Nosebleeds: The dry air can irritate the skin in our nasal passages and nosebleeds can result. To stop a nosebleed, put a drop of Serenity Lavender Oil on a tissue and wrap it around a small chip of ice. Place the wrapped ice against the base of the nose above the top lip and hold it there until the bleeding stops or as long as comfortable. Do not freeze your lip or gum. Relief for Eczema: Cold weather can exacerbate eczema and dermatitis. Add a few drops of Serenity Lavender Farm Essential Oil to coconut oil and use topically. Cold Sore Relief: place a drop of Serenity Lavender Farm Essential Oil on a cold sore for pain relief and to speed healing. Lavender is a natural antibacterial and anti-inflammatory. Try it on dry, cracked lips for fast relief. Freshen Bathrooms: place a drop or two of Serenity Lavender Farm Essential Oil on the cardboard core of toilet paper when restocking the bathroom. Alternately, you can also spritz the inside of the roll with Serenity Lavender Farm Linen Spray. Each time paper is taken from the roll it will release the fresh scent of lavender. Cold/Sinus Relief: Lavender can bring quick relief from colds and sinus infections. Add a few drops of Serenity Lavender Farm Essential Oil to boiling water and inhale the steam to open nasal passages, relieve coughing and throat irritation, and naturally aid in treating sinus infections. 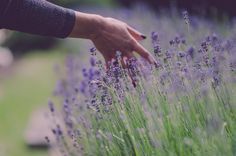 Rub a drop of Serenity Lavender Farm Essential Oil near nasal passages, on the back of the neck, at the temple, and on the forehead—avoiding the eyes—for relief from sinus pressure and inflammation. 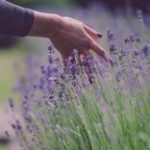 Put a pinch of Serenity Lavender Farm Culinary Lavender in your tea, or brew a cup of one of Serenity Lavender Farm’s specialty teas to aid in sleeping and bring relief to irritated throats. to brighten your winter, naturally!